In many states across the nation, the second Monday in October is somewhat contentious. While many calendars mark it as Columbus Day to celebrate his “discovery” of America, others see it as an opportunity to highlight the rich history and culture of the indigenous peoples of our country. Regardless of what title you give this holiday, it is a time to reflect on the natural riches and scenic wealth of our lovely lands. With thousands of native plants to admire, try out one of these two listed below for a bouquet or arrangement that was truly “made in America.” Not only are these native plants lovely to look at, but many also have served other important uses to America’s first peoples. 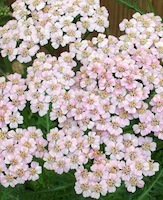 Native yarrow, Achillea millefolium, grows in dry, mountainous regions across the American west. This sunflower relative has hundreds of tiny flowers that cluster tightly together to form an flat, showy perch for butterflies and other pollinators. The leaves are soft and feathery, earning the name plumajillo (little feather) from early Spanish explorers making their way north. Long before them, the Navajo of the southwest were chewing its leaves and stalks to ease toothaches and the Miwok (of what would one day become California) found it helpful to treat a common cold. The Cherokee found a tea brewed from yarrow useful in reducing fevers, while the Zuni found that a poultice made from the pulverized roots and stems soothed burns. Useful and unusual, the yarrow looks lovely in a mixed arrangement and will keep its color even after it dries, allowing it to be used again in future arrangements. New cultivars like “Paprika” and “Terra Cotta” come in a beautiful red and bronze color, while traditional yellow and white colors add a lighter look to a vase and a wildflower look to any bouquet. Used by many people at the first sign of a sort throat, this native American medicinal plant makes for a great cut flower. 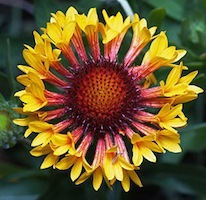 While not as long lasting as a sunflower or chrysanthemum, the unique central “eye” and pretty purple petals of this flower look great mixed in with yarrow and a few bright dahlias or plumes of native grass. 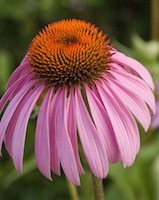 Used by the Pawnee, Lakotah and many other Plains Indians, echinacea has been evaluated in clinical trials for its medicinal purposes. A popular landscape plants in areas with a whole lot of sun and not a lot of water, this pretty purple daisy is a great way to honor the ingenuity of America’s indigenous peoples.